3 days kibale chimpanzee safari, the best ape tracking safari in Uganda. 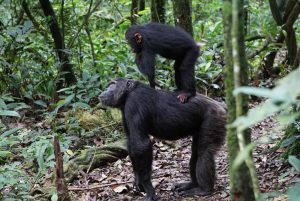 So on a 3 days kibale chimpanzee safari, expect the best of the best tracking safari experience as you encounter the chimpanzees of Uganda basically in kibale Forest. Remember they only allow trackers from the age of 15 and above. Day 1: Drive to Kibale Forest National Park. This day, drive to Kibale National Park through Fort Portal. Along the way, you will see wide scales of Coffee Estates. Have your lunch in Fort Portal Town. Later go to the Lodge for a relaxing. Accommodation: Primate Lodge, Kibale HomeStay, Isunga Lodge. Chimpanzee Tracking day. So in the Morning, Have enough Morning Breakfast and go to the Kanyanchu Tracking Centre for a Briefing by 8:00am. Enter the forest later on with the Wildlife Ranger who will lead in guidance into the Forest on search of the Chimpanzees. The lead guide will be so informative so don’t hesitate to ask various questions about the forests or the chimpanzees. You will stay with the chimps for 1 hour, after return to the lodge for lunch. Then in the afternoon, you will have a bigodi nature walk into the Wetland Swamp. With the Community so as to see more of the rare primates like Red Colobus Monkeys, Black and White Colobus Monkeys, Red Tailed Monkeys, vervet Monkeys, Olive Baboons and Much more with So Many Different kinds of Birds. Day 3: Drive back to Kampala or Entebbe. In the Morning, We will drive back to kampala after having a blast fun with the Wild Primates and Apes of Africa in the Kibale Forest. Then check in kampala or Entebbe in the Afternoon with Memories. This package excludes: entry Visa fees, drinks, laundry, tips to local guides, telephone, porter fee while trekking, personal travel or health insurance tobacco and of all personal nature.